BB cream has become very popular in recent years. BB stands for blemish balm or beauty balm. Compared to a tinted cream with a very light tint, BB cream has both the balancing and covering power of a foundation and the moisturizing power of a skincare product. It also provides a sunscreen all day long. Our best-selling Organic BB Crème is the ultimate multi-tasker and must-have for your makeup bag. Stop spending your money on all sorts of cover-ups and skin toners because this all-in-one makeup product will provide the perfect coverage while also providing anti-aging benefits and natural protection from the sun. Plus, it’s 100% vegan, natural, certified organic and toxin-free so you know that what you’re putting on your skin isn’t toxic. Our bioactive BB cream is perfect for those with hypersensitive skin, or conditions such as Rosacea, Eczema and Acne. 100% Satisfaction Guarantee! Our products are backed by our manufacturer 30day money back guarantee with free replacement warranty. 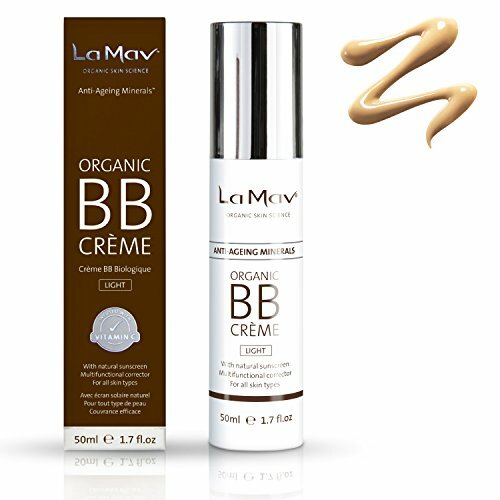 Click to add button to buy La Mav Organic BB Cream.